Good heavens, people. It's the last day of 2010. How did that happen? For posterity's sake... And might I add that this number is much higher than any of the previous years. Le sigh. One final week of the honeydew. Total weight gain: Not near a scale today as we're in a hotel but at my appointment on Tuesday I realized the alleged 1-pound weight loss from last week was a fluke. Up 2 lbs. Movement: Same ol', same ol... Still very active and movements continue to be bigger, sometimes uncomfortable, and occasionally painful. Cravings: I can't really think of anything. I have been more thirsty, though. Holy shish...Week 35! I'm hoping it's the last week of the honeydew. But then that means we'd be on to the last fruit. Period. Yikes. Total weight gain: This morning I seem to be down about a pound so back to 25. Interesting. Cravings: Ooh, I wanted Freebirds this week. Got it last night. Yum! Movement: Still very active and movements continue to be bigger, sometimes uncomfortable, and occasionally painful. 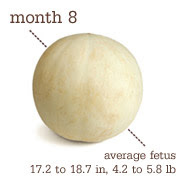 On to the (world's palest) honeydew! Total weight gain: About 25 pounds. So this is about a pound more than last week but let me tell ya...I feel like I've gained even more this week. And whatever weight that was gained went straight to the baby's muscles. Last week of the squash! Total weight gain: About 22 pounds. My first baby shower was the day before Halloween, hosted by my SIL (The Brother's wife) and her mother. Guests were mostly family and some friends of the family. Most of the ladies were mothers (or grandmothers or great-grandmothers) so there was a lot of experience in that room. And a little advice. The theme was fall (with a few Halloween decorations thrown in because it was, after all, the day before Halloween). As usual, the ladies did a great job on decorations and food. I love that one guest said that she had eaten before she came and another responded with, "Oh, I didn't. The last time I was here they had great food." And she's right. Total weight gain: Still about 21 pounds. Holy moly, we're finally done with the eggplant! 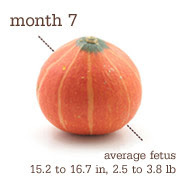 That's some sort of squash and we're in the 7th month. SEVENTH. MONTH. That's what happens to a plastic spoon when you leave it resting on a pan. An empty pan. An empty pan that is still sitting on top of a lit burner. Oh, well. This isn't the first weird plastic disaster this kitchen has seen (and no one was even pregnant then). Total weight gain: Still about 19 pounds. A few days late... But, hey! 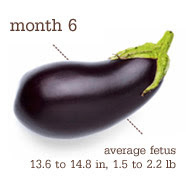 The baby is developing into an eggplant now! Movement: Generally, bouts first thing in the morning and the last thing at night. Plus a few times in the middle of the day and at least once during the night. This baby is crazy active. Cravings: Still loving the red grapes. And had some watermelon again and it was particularly good. And since it's fall? I could eat about a dozen apples dipped into that pre-made caramel sauce they sell in grocery stores. Symptoms: Crazy dreams, baby brain, forgetfulness, difficulty sleeping. I think I finally found a reasonably good pillow so while I may not be sleeping as well as I did pre-pregnancy, at least I'm not waking up with the same neck and shoulder pain. Oh, but speaking of pain, I have been getting some lower back pain on my right side after sitting for extended periods. Not fun. I foresee more massages in my future. Total weight gain: About 19 pounds. We had a doctor’s appointment on Monday and I was at about 17 pounds. It seems that we’re really not imagining that the belly has grown a lot this week. Movement: All the time. Sometimes while I’m supposed to be sleeping. Perhaps this is a sign of things to come. Cravings: Red grapes. I decided that this craving may be trying to meet my champagne craving. Or something. Hey, at least it’s relatively healthy. Way back in July, I marked a few things off the ol' Life List--visiting a new state (Minnesota) and a new ballpark (in, um, Minnesota). Because things got pretty crazy in August and September, I've totally neglected blogging about this. So July 15-19. I traveled up to Minnesota with my MIL and SIL. We flew into Minneapolis and then drove on up to Pine River. It's a small, quaint little town with two motels. We chose the better one. They had a Dairy Queen and a farmer's market. We visited both. The main reason we went up this far north into the state was so that we could drive up to where my MIL spent summers as a kid. She hadn't been in a very long time and my SIL and I had never been.